Costa Rica's Pineapple Express to Ruin? Costa Rica, among the happiest and most eco-friendly countries in the world, could be considered an oasis of peace in Central America. It is also known as the largest producer and exporter of pineapples in the world. Finding markets in developed countries, such as in the US and EU, has allowed the industry to grow from near nonexistence in the 1970s to surpass bananas to become the largest export crop in Costa Rica—bringing in approximately $800 million in foreign currency. Sweet Costa Rican pineapples, however, have left behind a sour aftertaste. Increases in global demand pressure farmers to increase productivity. To maintain high yields and quality, the pineapple industry has depended on agrochemicals. Yields have soared, but demand continues to outpace supply. 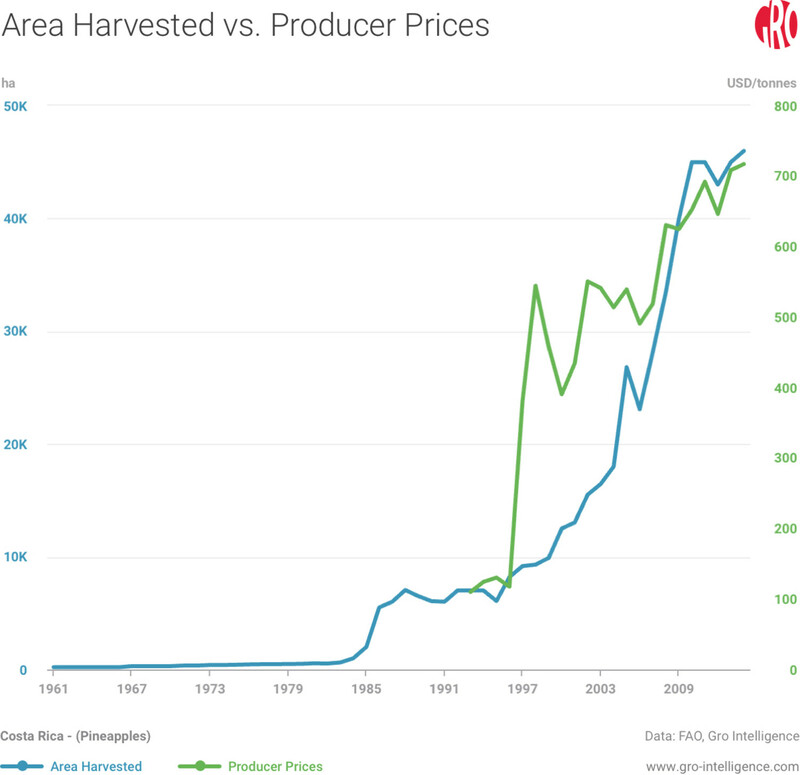 Rising producer prices have incentivized farmers, mostly on plantations, to plant even more pineapples. The pineapple industry has left much to be desired in its quest for better yields and low labor costs. Excessive use of agrochemicals—some very toxic to humans—over large areas has devastated communities. Water pollution has led affected areas to rely on trucked-in water since 2007. Low wages, unsafe working conditions, and a disregard for workers’ rights have created a disgruntled workforce. Adding to Costa Rica’s woes, consumers are increasingly aware of how and where their food is produced. With communities contending with excessive pollution and workers rights violations, the once-promising industry could be on a road to ruin. Rising demand has made pineapple production progressively more lucrative in Costa Rica. Farmers ripped out a diverse ecosystem to plant more pineapples for investors. Without the vigorous application of chemical pesticides and herbicides, the industry may never have flourished. The humid Atlantic region of Costa Rica, where most of the pineapple plantations are located, breeds swarms of fruit-loving pests. 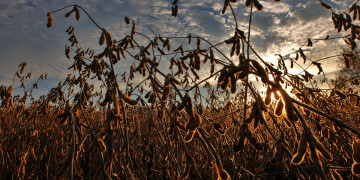 Farmers have turned to pesticides to prevent the destruction of their valuable crop. 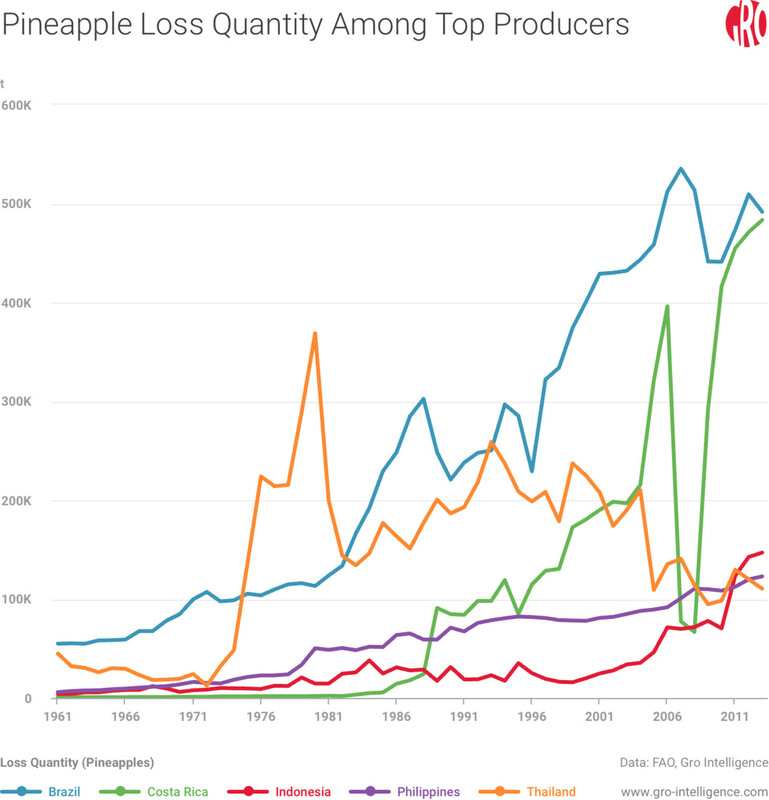 While data inconsistencies in the mid-1980s leads to some ambiguity, it's clear pineapple production soared during that period well beyond previous yields in the 1960s and 1970s. Agrochemical usage is rampant in Costa Rica, and the country is the top user of them for its size in the world. Costa Rica’s National Institute of Toxic Substances says the country uses about 18.2 kg of agrochemicals per hectare. 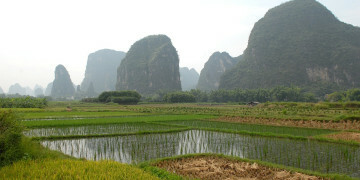 China ranks second at 17 kg of pesticide per hectare. Pesticide use in Costa Rica has declined since increasing threefold from 8.2 to 25.8 kg per hectare from 1997 to 2006, but its top crops are still quite dependent on agrochemicals. Bananas use 49 kg per hectare of pesticides while pineapples use 30 kg per hectare. Costa Rica’s foreign trade statistics show that between 2012 and 2016, import volume of herbicides grew by 14 percent. More concerning is the type of pesticides used by the pineapple industry, including Highly Hazardous Pesticides (HHPs). The compound paraquat, used in pineapple farming, is banned in the EU because of high toxicity and has been recently linked to increased rates of Parkinson’s disease. In Costa Rica’s pineapple plantations, paraquat is used to dry-rot pineapple cones allowing the biomass to be recycled. Although some of the largest players in the pineapple industry implemented a phase-out program for paraquat, that does not reduce the cumulative harm already caused by HHPs. Costa Rica has a tropical climate with high rainfall. Pineapple plantations are located in the areas that receive the most rain. Pesticides and other agrochemicals dissolve in rainwater, and runoff ends up in aquifers, rendering the water undrinkable. Since 2007, the communities of El Cairo and Milano, near Siquirres in Limón Province, have had to rely on water deliveries. The residue level of the herbicide bromacil found in underground water reservoirs was about 20 times that permitted by the EU. Pineapple plantations require a large manual workforce. In addition to farmers, more workers are needed for preparation and packaging of pineapples for the fresh market on-site. With retailers sometimes engaging in price wars, plantations have found ways to reduce costs while improving productivity at the expense of workers. Low wages and rights violations have kept costs low while forcing workers to work longer hours. A great deal for the plantations comes at a high cost for countless workers, some of whom are immigrants without work authorization and under constant threat of deportation. Low unionization levels further limit the abilities of workers to improve safety or wages. Before the mid-1980s, pineapple plantations were still in their infancy and banana plantations had unionization levels over 80 percent. Trade unions representing workers of banana plantations defended their members against increases in work hours and unfair remuneration. Trade unions called a strike in 1980 to defend members’ rights. Banana companies alleged trade unions were making unrealistic demands. Unions refused to budge. The standstill lasted until 1984 when confrontations became violent. 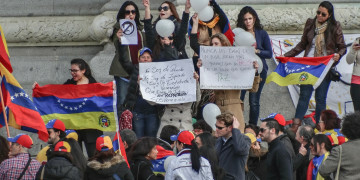 The strike ended in a deadlock, and could be seen as the start of the fall of unionization within plantations and the rise of the Solidarismo Association. Reduced productivity from exhausted Pacific Coast land forced the industry to move to the Atlantic Coast. Owners used the opportunity presented by relocation to force negative changes in their relations with their labor. The solidarismo movement emerged, which is akin to union busting in Costa Rica. Through the new solidarismo movement, workers elect representatives who negotiate on their behalf. Workers also get to contribute 3-to-5 percent of their incomes—matched by their employers—to a common fund. Workers, in theory, have access to these funds in the form of loans. The arrangement requires workers to sign direct agreements with employers, which renders workers powerless in negotiating for better pay or improved working conditions. Plantations use the threat of massive layoffs to further limit the power of workers. Owners won’t rehire workers after telling them they will be retained, for example. Layoffs can be used to get rid of sick, aged, or unionized workers so owners can hire new workers for lower wages. Workers are frequently exposed to toxic chemicals for long periods of time while performing backbreaking work—bending over to tend to low pineapple plants—without a system to file complaints. Workers often have to eat their lunch meals within the plantation over concerns they won’t be rehired. Unsatisfied workers may actually be costing the industry in the form of lost pineapples. Among the top producers, Costa Rica loses the second-largest amount of pineapples annually, behind only Brazil. In 2013, 18 percent of pineapples produced in Costa Rica were lost. During the same period, Brazil lost 19.8 percent, Thailand lost 5.3 percent, and the Philippines lost 5 percent. Brazil, like Costa Rica, has workers who earn poverty wages while working in harsh conditions. In fact, immigrant workers in Brazil are paid below minimum wage. These practices by the pineapple industry may be reducing the appetite for the fruit within the country. 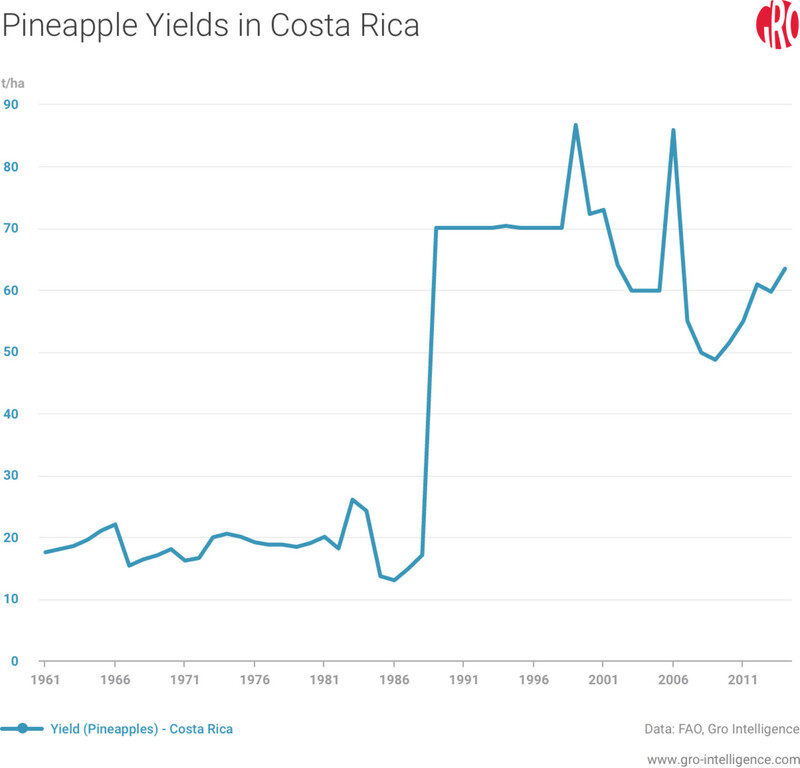 While GDP per capita in Costa Rica grew by 303 percent between 1992 and 2013, consumption per capita of pineapples in Costa Rica fell by 17 percent. Instead of squeezing the workforce even more, the industry could try to capture more of the entire value chain. Most of the pineapple produced in Costa Rica is either consumed locally or exported without further processing. An improved processing infrastructure could add value locally to the country’s exports. Other top producers export more processed pineapples, which makes the fruit even more valuable. Compared to Thailand, Costa Rica earns just 62 percent more money, while exporting 247 percent more in terms of weight. The Philippines and Thailand lead in terms of exports of canned pineapples. 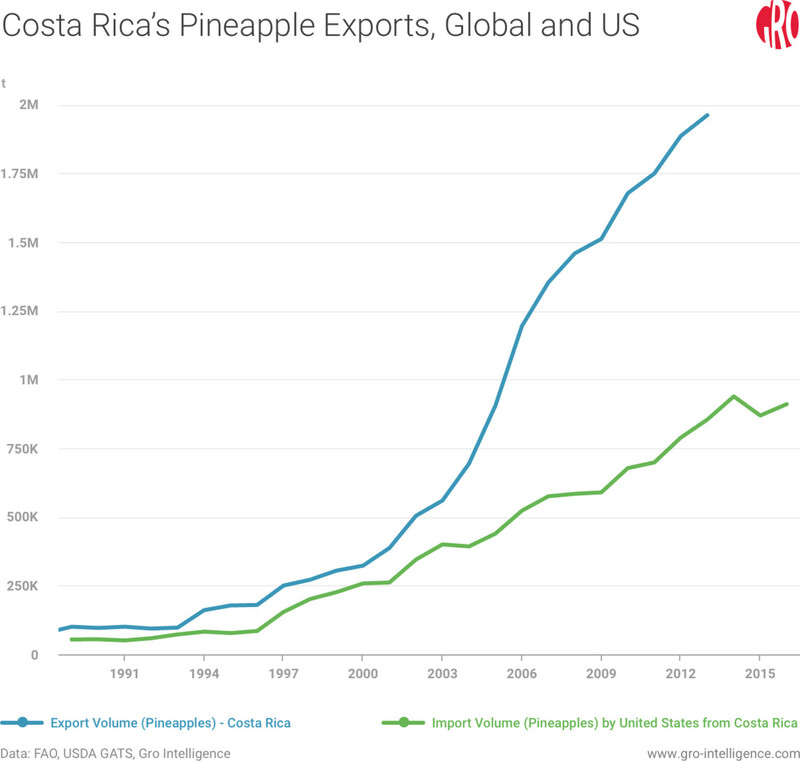 By trading exclusively in fresh pineapples, Costa Rica is missing out on more profit from highly-priced processed pineapples while simultaneously exposing itself to the physical loss of pineapples across the value chain. When price wars happen, Costa Rica pays dearly for it through the environmental and social costs of pineapple farming. Without a proper way to distinguish, or price-differentiate, sustainably grown pineapples, farmers have insufficient incentive to change their practices. For example, farmers can choose to wait for pineapples to rot naturally before replanting or they could use paraquat to boost the rate of decay, productivity, and profit. Pineapple is a very important crop to Costa Rica in terms of foreign currency and employment opportunities. Environmentally unfriendly production practices, disgruntled communities, and unsatisfied workers partially offset the benefits of pineapple cultivation. A new wave of activism has been directed against pineapple plantations and other unsustainable crops. If deteriorating labor relations and rampant environmental pollution are not addressed, the industry will suffer further. To consumers, who seem to be shopping with their consciences along with their wallets these days, Costa Rican pineapples are an increasingly rotten deal. Pressure is mounting for a tariff classification system that allows consumers and traders to trace where their products are coming from, and to vote with their pocketbooks on better production practices. Countries reliant on farming and plantation sectors describe such a classification system as a technical barrier to trade, but consumer forces may impose one regardless of producers’ wishes.